Designer: Wilkinson Eyre. Contractor: Harbour & General. Traffic: Pedestrian & cycle. Length: 413 ft (126m). 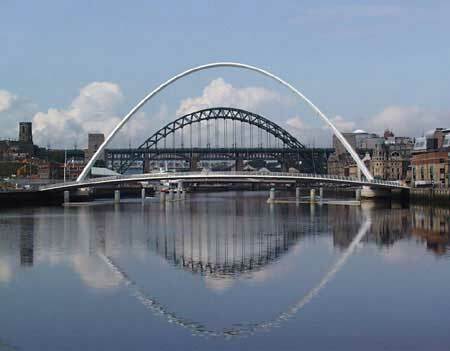 The Gateshead Millennium Bridge, a 600 tonne structure, will slowly open turning on a pivot like a giant eyelid to form an arch to allow ships to pass below it. Significant dates: Bridge manouvred into position by the giant crane Asian Hercules November 20th 2000. First test of the tilting mechanism May 24th 2001. Public opening of the bridge September 17th, 2001. Official opening by Queen Elizabeth II May 7th 2002.